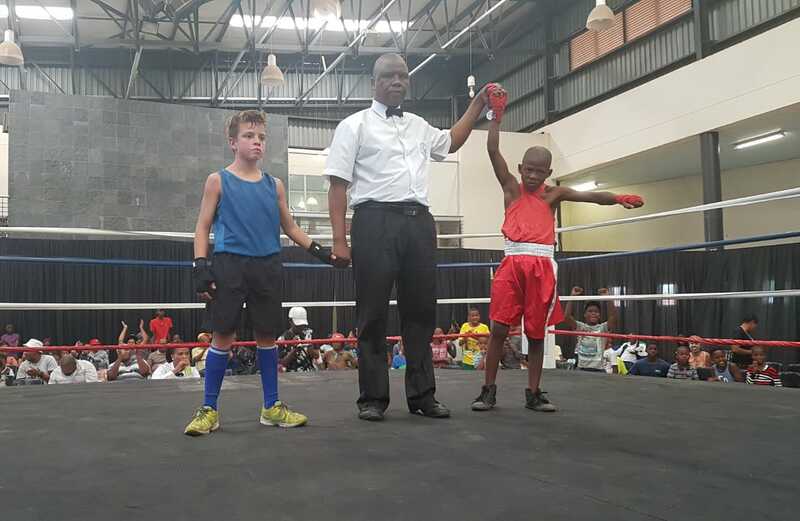 Galeshewe (20/10/2018) – Home Defenders Boxing Club’s Inter-Club Tournament validated the Northern Cape’s prospects of a much improved position at future national championships. 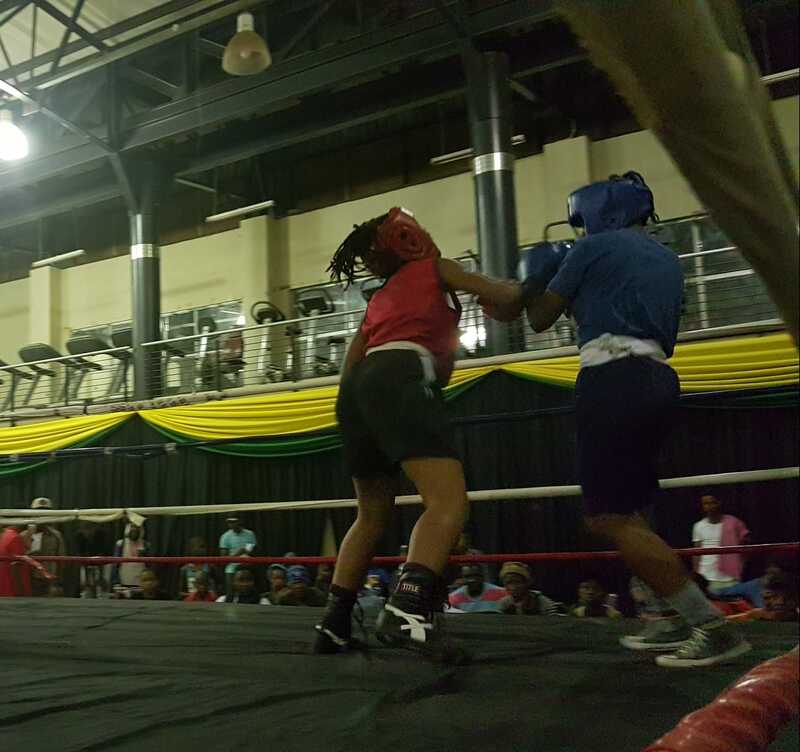 With the tournament having been hyped as an “Inter-Club Boxing Extravaganza,” fanatics of the game of the fisticuffs who had packed Galeshewe’s Mayibuye Multi-Purpose Centre, feasted to a dazzling display of amateur boxing. 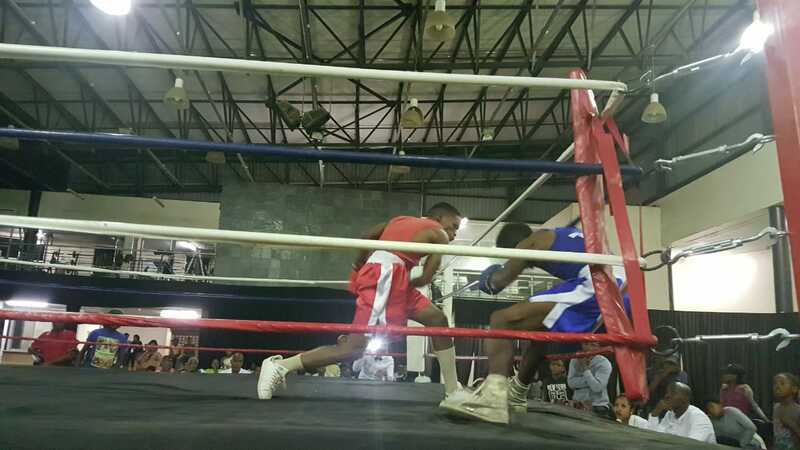 Having clinched position seven (7) under difficult circumstances at the recent Junior and Youth Championships held in Limpopo under the banner of the South African Boxing Organisation (SANABO) earlier this month, most of the provinces amateur boxers that had featured at the championships were back in action past Saturday. The mesmerizing boxing started as early as the third bout with the crowd spellbound. Home Defenders Boxing Club’s (HDBC) Tshepo Fischer outsmarted and outmaneuvered Northern Cape Boxing Academy’s (NCBA) Liam Koen in a rare slugfest that does not normally come in the 30-32 kg weight division. The match-up heralded a future rivalry. They could be under-10 but their act was of boxing style and class, hence they got a standing ovation powered with a resounding round of applause from the crowd. Fresh from having won a silver medal at the championships, HDBC’s Marcel Kwes who clinched Best Junior Boxer of the Tournament trophy should be kept in boxing at all cost. He went toe-to-toe against Blossom Boxing Club’S (BBC) Dimpho Phepheng in the 50kg weight division. Kwes’ nimble footwork and tactical boxing style that comes with telling punches gives much to write home about. It was not only in winning. Sylvester Sekese of BBC was awarded the Best Boxer Youth despite having lost to Freedom Boxing Club’s (FBC) Lebogang Mohosh in what appeared like a mismatch in 52kg weight division. Critically; it still baffles the mind as to how both boxers took to the scale equally. A much heavier looking Mohosh used his reach and strength very well in jabbing at Sekese throughout the three-rounder. Sekese is also one of the boxers that made the Northern Cape proud at the championships. Another boxer who has got stars written all over his name is Tshepang Thesebe of FBC. He was the only boxer that went in for two fights in the 57kg weight division. Thesebe’s opponents are not worthy of any mention as they provided no match and instead gifted him with knockouts. HDBC’s Frans Blom should come in for some reprimand for playfulness and unnecessarily resorting to Muhammad Ali’s “rope-a-dope.” The 44-46 weight category fight should not have gone the distance but then Blom gave BBC’s Quinton Sekese too much breathing space. In another tactless act and from the same HDBC stable, was Tshepiso Fischer who handed his fight over to Tlhafelo Dikwidi of Sesheng Boxing Club (SBC). Heavily in the lead and with probably under a minute to go in the last round (3), Fischer failed to box on, bending and signaling to the referee that he had run out of steam and shamefully so at a weight of 50Kg. 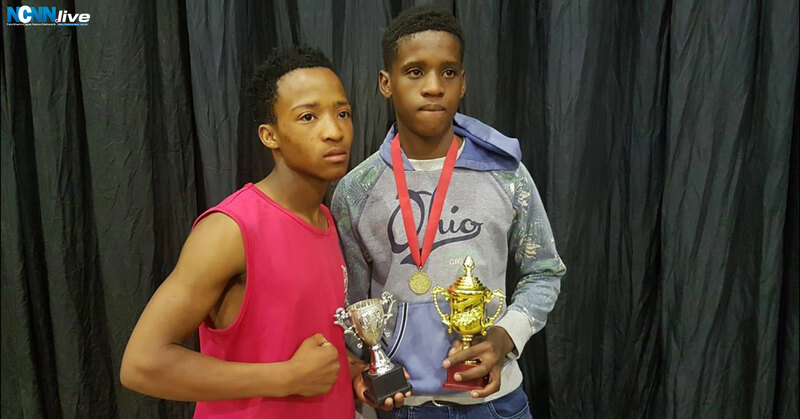 Even though Bethlehem’s Smiling Tiger Boxing Club (STBC) only had two boxers that had featured in the tournament, Tshepo Gadebe’s victory over JDI’s Tshepo Nikwe (50-52Kg) and Tshepo Mokgele’s hammering of Michael De Beer of NCBA (44-46Kg) gave a good account of boxing beyond our provincial boundaries. In the elites (seniors) bouts, HDBC’s Thuso Motshabi outpointed Just Do It’s (JDI) Shuping Maseng with some fine hand-speed which got the latter against the canvass time and again in their 52-56 weight fight. In the only female fight of the tournament and staged as an exhibition bout, from the NCBA stable it was Lethabo Balang who was up against Rorisang Pholoholo and with the latter winning the fight. HDBC’s legend Joseph “Smiling Tiger” Mokubung was asked to say a prayer in opening the tournament. Mokubung boxed as an amateur in the 70s and 80s, gaining local repute for having won one silver and two bronzes at the national championships. He also fought against the likes of Kimberley’s Frank Khonkhobe who went on to turn professional and become South Africa’s Featherweight champion in 1987 albeit briefly. Khonkhobe is also best remembered for having gone pound-for-pound against one of South Africa’s best ever boxers in the person of Brian Mitchell whom he lost to in a 12-rounder Super Featherweight title fight in 1983. Mitchell, an inductee of the International Boxing Hall of Fame, was a world Junior-Lightweight champion across two bodies World Boxing Association (WBA) and the International Boxing Federation (IBF). Back to the tournament; the teams that did not honour their invitations were Thabong Boxing Club (Welkom), Amaroc Boxing Academy (Bloemfontein), Motaung Boxing Club (Kuruman), Bosasa Boxing Club (De Aar) and Vaal Reefs Boxing Academy (Sebokeng). Marcel Kwes of Home Defenders Boxing Club clinched Best Junior Boxer trophy whilst Blossom Boxing Club’s Sylvester Sekese (in red vest) got one for tournament’s Best Youth Boxer. In Full Swing: Fighting from red corner Home Defenders Boxing Club’s Thuso Motshabi punishes Just Do It’s Shuping Maseng with a barrage of punches. In the only female bout of the tournament was Rorisang Pholoholo against stablemate Lethabo Balang (red corner) of Northern Cape Boxing Academy.